Visible divisions within the Chinese American community over NYPD Officer Peter Liang’s conviction in the death of Akai Gurley have created a news and social media spectacle, and deep anxiety for many Asian American racial justice activists. Personally I agree with Liang’s conviction, and strongly condemn the threats and intimidation that some Liang supporters are waging against CAAAV, which has stood staunchly by the Gurley family. But like others, I’m disturbed at how things have become so polarized, and wonder if, despite the optics, Asian Americans may find some room for agreement across the fault lines that have emerged. First, the facts: Officers Liang and Shaun Landau were conducting a vertical patrol in the stairwell of the Pink Houses, a low-income housing project in Brooklyn, on Nov. 20, 2014. Akai Gurley was visiting a friend there, Melissa Butler, and they both entered the stairwell on their way out of the building. Liang and Landau also entered the stairwell, two floors up. Liang had his gun drawn and fired a bullet that ricocheted off a cinder-block wall and hit Gurley in the chest. A medical examiner later found that the bullet had torn through Gurley’s body, fractured his third rib, nicked his sternum, and pierced his heart and diaphragm. The medical examiner ruled Gurley’s death a homicide. Upon learning that Gurley had been shot, neither Liang nor Landau provided medical assistance. Butler attempted CPR, having never done it before, with instructions relayed by a neighbor who was on the phone with a 911 operator. Several minutes after firing the shot, Liang got on his police radio to call it in. Three more officers arrived, one of whom took over CPR from Butler. Minutes later, at Brookdale Hospital, Gurley was pronounced dead. He was 28 years old. On Feb. 11th of this year, a jury found Liang, now also 28, guilty of second-degree manslaughter. The New York State penal law states: “a person is guilty of Manslaughter in the Second Degree when that person recklessly causes the death of another person.” The conviction does not speak to intent to kill. Instead it says that Liang engaged in conduct that created the risk of a person’s death, and that such conduct resulted in Gurley’s death. Surely there are other cases of police officers who have not been indicted whose actions were more reckless, or even driven by intent, and that led to the deaths of innocent, unarmed Black people. But in this case, the state decided to prosecute the officer, and a jury convicted him, which could help to build momentum in the movement for police accountability. I see Liang’s conviction as a fair outcome, given the letter of the law, which is the only meaningful government recourse for accountability in cases of police officers who kill. Liang’s attorneys are appealing his conviction, but as it stands, he faces up to 15 years in prison, which I imagine must be terrifying for him and his family. The divisions among Chinese Americans and to some extent the broader Asian American population in this case can be boiled down to this: some support Liang’s conviction as one step forward in the movement to demand police accountability, given that so few officers are ever prosecuted, let alone convicted, of criminal behavior in the killing of unarmed Black civilians; others see the conviction as an example of anti-Asian, and specifically anti-Chinese, racial animus, selective punishment based on Liang’s race. I would submit that both things could be true, and honestly, I can empathize with some of the perspectives on either side. In reality, as so often happens in acts of violence, Gurley’s death at the hands of Liang has caused injury to the families of both the victim and perpetrator. Moreover, the impulse for Asian Americans, and specifically Chinese Americans, to distrust the state is a rational one, based in historical precedent. The case often cited by Liang’s supporters is the murder of Vincent Chin in 1982, but the history of state-sanctioned violence against Chinese people and Asians more broadly has both a much longer history, and a more recent one. Against this backdrop, charges of anti-Chinese bias in state institutions are not unreasonable, and that bias is something that we should all agree is wrong. The problem lies in calls to acquit Liang. Drawing attention to anti-Chinese or anti-Asian institutional bias is one thing, but insisting on impunity for Chinese American police officers, because white police officers receive impunity, is another entirely. It is ahistorical when considered against the backdrop of quotes from Dr. Martin Luther King, Jr., and citations of Vincent Chin’s murder, both present during the pro-Liang rallies. 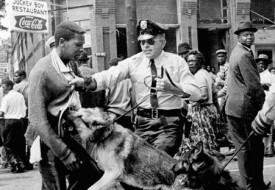 Dr. King condemned police violence. Neither Vincent Chin, nor the millions of Chinese migrants who were barred from legal entry to the United States, was a police officer. While Liang was a rookie cop and not a police chief, he was nonetheless an armed, publicly funded officer of the police department. But this ahistoricity, this impulse to draw false equivalencies, doesn’t surprise me. It reflects an all-too common tendency to take what could be a nuanced view (i.e., the police system is racist and Liang may have been subject to anti-Chinese bias) and flatten it into an ethnic nationalist position of believing that all Chinese Americans are equally victimized, regardless of their relationship to structural power. That is not true, but the current politics of race in America rarely allow for nuance. The reality is that I can have sympathy for Liang’s situation, while also supporting his conviction, and demanding accountability for all police officers. Asian Americans are frequently confronted with nuance. We are at once racialized as terrorists, spelling bee champions, criminals, tech geniuses, master cellists, sexual fetishes, dangerous interlopers, and robotic wage slaves. We are widely cited as drivers of demographic change, but there are real divisions among us – of class, religion, immigration status, color, gender, sexuality, language, and political histories. In aggregate, we are a little bit of many things. That makes building unity difficult. Those divisions have been exacerbated over time by western influence through war, colonization, selective immigration policy, and the making of the model minority myth. In response, as activists we are forced to think deeply, as all organizers must, about where there are common interests across those divides and with other communities. Grassroots organizations like CAAAV have worked to build a base of poor and working class Asian Americans who understand the connections between their lived realities (low-wage work, wage theft, eviction, poor housing conditions, incarceration, deportation, inadequate education) and the historical forces of white supremacy. They understand that broken windows policing clears the path for gentrification, for example, and that building multiracial unity for police accountability is a long-term strategy for structural change. But those of us who don’t work in such organizations can also play a role in popularizing this understanding, by engaging those who may not subscribe to our politics in our families, in our neighborhoods, and in our religious and other community institutions. I understand the sentiment. I look at Peter Liang, and I see someone who looks like my brothers. I can imagine what it must be like for his parents—a garment worker and restaurant worker—to face the terrifying prospect of their only son going to prison. And I get why, when the vast majority of mostly white officers aren’t indicted when they shoot to kill, one might be upset that an Asian cop is the one who is. But at its heart, this argument is deeply flawed. The same is true now. We can have empathy for Liang while also realizing how America’s policies of Asian exclusion, its culture of xenophobia, and incidents of anti-Asian violence are deeply connected to the history of chattel slavery and settler colonization, to the structural drivers of American racism that writer Ta-Nehesi Coates so simply and aptly calls “plunder”. 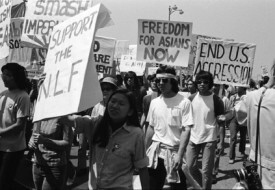 Asian and Black liberation are intertwined, and contrary to popular belief, there is a robust history of Asian Americans who have acted on this knowledge. Race is polarizing. That has always been its purpose, to divide humanity and exploit those divisions for the benefit of elites, at limitless human cost. In the words of Ruth Gilmore, “Racism, specifically, is the state-sanctioned or extralegal production and exploitation of group-differentiated vulnerability to premature death.” That is the brutal project in which Liang was implicated, the one that led him to take Gurley’s life, knowingly or not. Unless we work together to end the particular violence that institutions from public housing projects to police departments inflict on Black communities, that violence will affect our lives as well – even the lives of those seeking validation in a badge and a gun. For Asian American racial justice activists, this is a time to build our ranks, not close them. We should challenge those in our communities who have bought into individualism and dominant racial thinking, but in ways that allow them to move, by acknowledging where they have legitimate concerns. There will always be those who disagree with us and who are determined to attack our position. We can’t move them and we shouldn’t concede to them. But we can split their base of support by showing that this is not a matter of Black or Asian interests; it’s a matter of both. Working for police accountability, combatting anti-Asian discrimination, and supporting Black liberation are not mutually exclusive. They are, and always have been, in our collective self-interest. The union rep texting was widely reported initially but turned out to be a false but effective character assassination rumor. Where it came from, no one knows, but there was no evidence of it and prosecution, which has access to telephone and redio records as well as Peter Liang’s parter’s testimony through an immunity deal, never brought it up in the indictment or actual case. You need to think about this along the lines of “affirmative action” or “positive discrimination”. Why on earth should one ethnic group (Asians) be peanlized more that another ethnic group (Whites)? Convicting an East Asian will do little to sway the views of White police officers who are already operating immoral tactics.